​As the leaves have a mildly astringent taste they are great for sauces made with cream as their flavour cuts the richness of the fat. English Mace is apparently a good combination with asparagus – for example using it in Asparagus Quiche, or in Cream of Asparagus soup. The leaves can be used fresh or cooked and add piquancy to chicken, pork, fish, cheese, pasta and rice dishes. They can be used in stuffings, salads (especially potato salads), soups and stews. Dried leaves are used as a tea. spicy foliage. Propagate by division in spring or autumn. but full sun is essential. 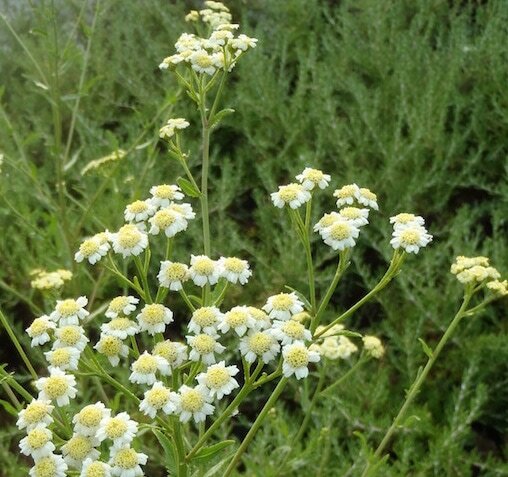 ​Mace is a relatively unknown perennial herb that deserves more popularity. Not to be confused with the spice called mace, which is the outer husk of the nutmeg, English Mace is a member of the Achillea family. It spreads gradually to make a fine clump of bright green divided foliage and flowers from mid to late summer. The flower stems are tall and strong, making it ideal for a windy position, and each carry masses of creamy white daisy flowers. The flowers are very long lived and the plant can bloom well into the autumn. The flowers can be cut for arrangements in the house and also dry well as complete stems for winter. The aromatic leaves can be used when young to flavour soups and stews and can also be chopped onto potato salads. The leaves should be used sparingly so that the flavour does not overpower.